By in Uncategorised on 12th December 2014 . Dawson Lewis, a member of Development Team 6 and the point of contact to DOT, likes to make money the old fashioned way on weekends. The REALLY old fashioned way. As in hand striking coins the way it was done 1000 years ago in Saxon England. Dawson is a member of the local chapter of Society for Creative Anachronisms (SCA). The SCA is a living history group with 30,000 members around the world. The focus of the SCA is to allow members to recreate aspects of life in the Middle Ages. Whether armored combat; spinning yarn (and yarns! 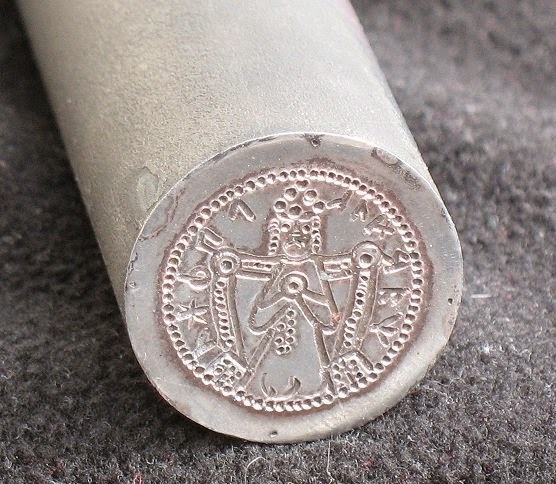 ); dyeing cloth, recreating historic clothes; calligraphy; casting pewter; bread, cheese or wine making; blacksmithing or (in Dawson’s case) making coin dies and striking coins: if it was done in the Middle ages there is probably someone doing it in the SCA. If anyone is interested in knowing more they can contact Dawson or go on line at PierreSCA.org. Dawson Lewis striking coins with a very young assistant!